Donations can be made through the Canada Helps link below. Many have asked how things are going with the rebuild of our barn and added aquatic facility at Sandy Pines. 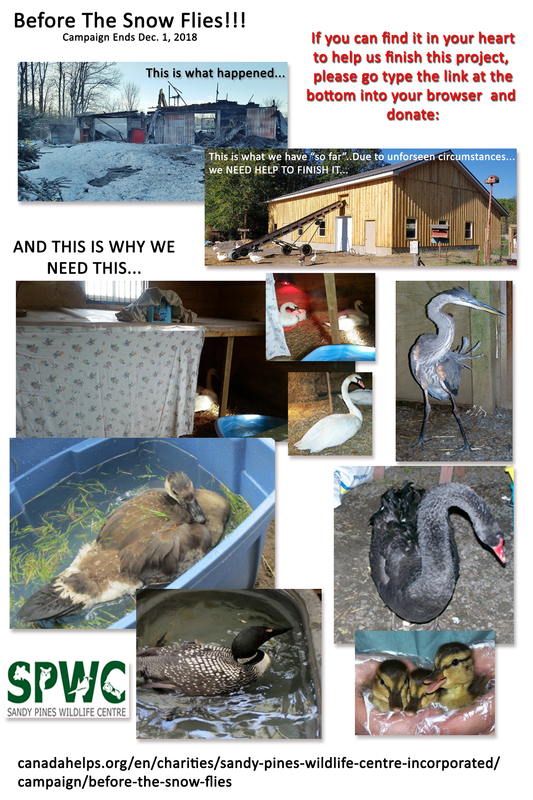 Unfortunately, the project has hit some stumbling blocks along the way, and it is looking as if we will not be able to use the barn for animal care this Winter. The first difficulty we encountered was that our contractor suffered a devastating accident and has been in hospital since the concrete was poured in late June. His team continued on to the best of their ability, and finished as much of the project as they were able to. They were able to build the exterior of the barn and the hay mow. Unfortunately, the plumbing, electrical, painting of the exterior, flooring, insulation and carpentry of the barn interior are looking like they might not happen this year. This is very stressful for Sue Meech who has provided shelter for both wild and domestic animals in her barn over the past 30 years. We need a contractor with barn or agricultural building experience to take over the work. We are facing the reality that the Aquatic Centre will likely be a project for next year, as funds are running low, and costs are running higher than our team had anticipated. As with most building projects other unforeseen costs creep in. One of those unexpected costs was that we had to have a new well dug as the two wells we currently have on the property struggled to keep up to the water demand this past Summer. We managed approximately 350-430 patients in care most of the Spring and Summer. We have currently had over 3900 patients pass through our doors this year. Several upcoming fundraisers will hopefully help raise some much needed funds to continue on with the building and daily operations. Our Internship Application Deadline Has Been Extended! SPWC Calendar Is Almost Gone!